I think if there is one thing that really stands out about how Walt Disney World completes the show each and every day, it has to be the NIGHTTIME! After a long day at any of the four theme parks of Walt Disney World, are you ready to sit back, relax, and enjoy a command performance level closing to the days show? Well, if you are, you’re in the right place! With the exception of Disney’s Animal Kingdom (due to be corrected at some point in the “near” future), there are three nighttime spectaculars that put the exclamation point on your day! At Disney’s Hollywood Studios, we get to see what Sorcerer Mickey is up to, or rather up against, in the high energy pyrotechnic and water screen presentation of Fantasmic! Located in the Amphitheater on Sunset Boulevard, the spectacular show weaves a story that will delight into your evening. The finale is a nice ride down memory lane that involves many of the beloved Disney Characters to delight kids of all ages. Including, us older kids!! EPCOT offers Illuminations! This offering can be seen from just about anywhere around the Promenade that borders World Showcase Lagoon. There are a lot of pyrotechnics and a globe that glows in the middle. It is a fabulous presentation and the music is quite beautiful, too. If you haven’t seen Illuminations! you must take time on your next trip. One small hint: Many of the restaurants that are around the lagoon have seating areas to watch. IF you can get an ADR in the 7:00PM range, and are willing to wait a few minutes, you may get a table with a view. Finally, The Magic Kingdom has a number if things to offer after the sun goes down. First, is The Main Street Electrical Parade. This is the classic Disney parade with a lot of lights and so many of the Disney characters that we have all grown to love and adore! It starts at Town Square and makes it way down Main Street U.S.A through Liberty Square and finishes at Frontierland. Good seats can be had all along the route, but you can head to Frontierland for the little ones to get a closer view! Second at The Magic Kingdom is Celebrate The Magic. Cinderella’s Castle is lit up with an array of projected images and a soundtrack to augment what you see on the Castle. There are a lot of Disney enhanced colors and images, as well as clips from some of Disney’s most beloved movies. It is a short show, but it is a nice lead in to what comes next. And, that it Wishes! Wishes! 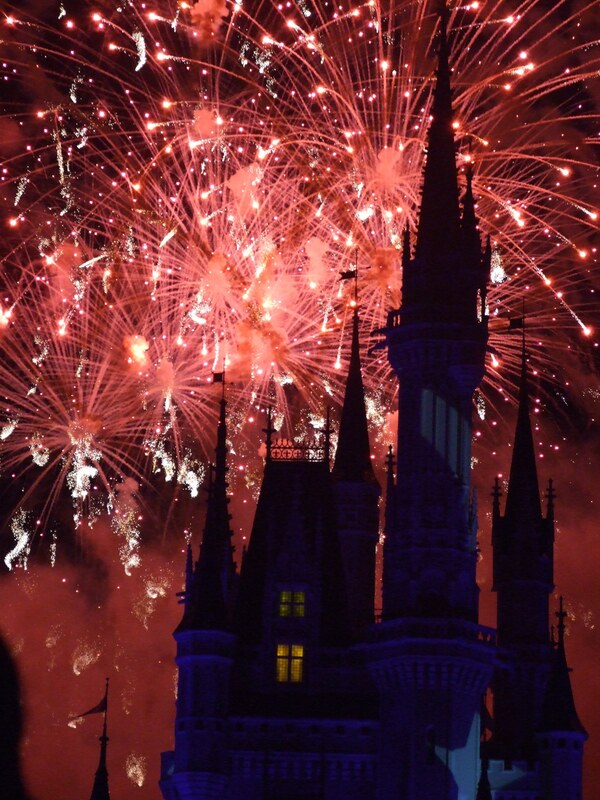 is the nighttime fireworks display that The Magic Kingdom presents every night on one form or another. There are some night in the fall that park guests can only see if they purchase a separate party admission. Those are Mickey’s Not So Scary Halloween Party and Mickey’s Very Merry Christmas Party, both which have special Wishes! presentations with tie-ins to those holidays. There are many places around the hub to view Wishes!, as well as places along Main St. U.S.A. and the train platform at Town Square. You can see most of it from Tomorrowland, a view I got this past December. The music is played in all areas that have any kind of view. I need your help!! Please pass this blog on to anyone you think might enjoy it! And, if you have anything you would like help with, just let me know and I’ll do my best to get answers for you! As always, have a Blessed and Magical day!! Author threestrandswdwPosted on 01/31/2014 01/31/2014 Categories Disney Destinations, Disney memories, Disney World Trip Planning, Disney's Hollywood Studios, EPCOT, Magic Kingdom Park, Main Street Electrical Parade, Walt Disney WorldTags Disney Fireworks, Fantasmic!, Illuminations!, Wishes!